Photo by Katherine Welles on Shutterstock. MillerCoors is sending free suds to a whopping 138 Milwaukee-area bars just hours before the Brewers kick off the NLCS. Attention, Milwaukee: the first round of your Brewers NLCS pre-game is on MillerCoors. The brewery is offering a free Miller Lite – one per person, while supplies last – from 3 to 5 p.m. on Friday, Oct. 12, at 138 bars in the Milwaukee area. 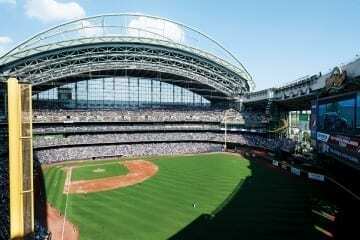 That’s just hours before the Brew Crew opens the National League Championship Series against the Los Angeles Dodgers at 7 p.m. at Miller Park. “While supplies last” can be a slippery disclaimer, but Miller Brewing Co. General Manager Jim Kanter said the intent is to serve everyone who shows up during those two happy hours. The open taps stem from a “bet” between the two breweries that make up MillerCoors’ name on the outcome of the National League Divisional Series. The Brewers swept the Rockies, so Colorado-based Coors is picking up the first round of Miller Lites for Milwaukee. The two breweries have the same corporate parent, so it’s not exactly a bet as much as a promotion but… hey, whatever. Free beer! The 138 bars are scattered across the city, but it’s worth noting there are large areas of the North and West sides without a participating outlet. The bars were selected based on their historical sales of Miller Lite, according to Kanter. Tavern At Turner Hall, 1034 N. Vel R Phillips Ave.